Most of us work day and night all through the week and would be eagerly waiting for the weekends. The two days are meant to relax and rejuvenate oneself to face the week ahead with renewed passion and enthusiasm. Nowadays, people are looking for something different to be done on the weekends, for which most of us usually rush to the nearest hill stations for a quick connect with Mother Nature. Many us have a love for outdoor activities, such as trekking and hiking amongst others. For the lovers of trekking, we bring you Baamikonda, or Bavikonda, which serves an ideal weekend getaway to connect with Mother Nature and simultaneously satisfies the desire for an adrenaline rush. The trail to the peaks of Baamikonda and Kaalchukki are one amongst the untouched and breathtaking trails which would truly rejuvenate you. Baamikonda is located in the Chikmagalur district and lies on the outer edges of the well-known Kudremukh National Park. The trek starts from the Mullodi village which is surrounded by gorgeous waterfalls which is 15 km away from the summit. The landscape of this place is simply serene and the atmosphere is perfect for a detox. One gets to see the step cultivation practised by the villagers here, along with clouds floating near the horizon, which makes it a magical sight to see. The trail to the Kaalchuki Peak is an easy one which passes through the open face of a mountain. The hike is actually through a ridge which is quite narrow, but a manageable one. After an hour of hiking, we would reach the peak of Kaalchuki. 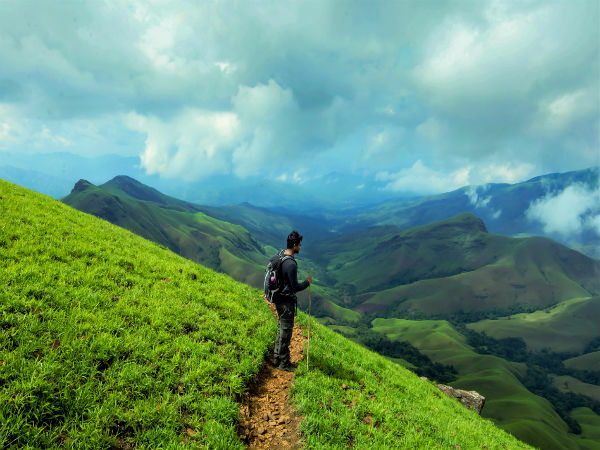 And the sight which unfurls in front is the majestic Kudremukh Peak along with lush green mountains which are home to the shola forests, which definitely is a visual treat for your eyes. Throughout the trial you can see how the forest opens out before you to vast stretches of green pastures and blue skies, calling you into her open arms. As one would further head towards the peak of Kaalchukki, the village is left behind to enter into the lands of greenery and serenity. One would be able to see the peaks of not only Kudremukh but also other peaks of Chikmagalur from here. One can visit Baamikonda anytime of the year, as the place showcases its own charm in every season. If you want to hike here during monsoons, there is good news as well as bad news. The good one first, which is the undiluted beauty of the place which gets more beautiful during this time. The entire location is wrapped in hues of green with clouds passing by the place, giving out a surreal experience. Now coming to the bad news, which are leech attacks! Hence, it is advisable to carry salt packets with you to keep them at bay. One can as well apply a mixture of salt and coconut oil which prevents the leeches from attacking.